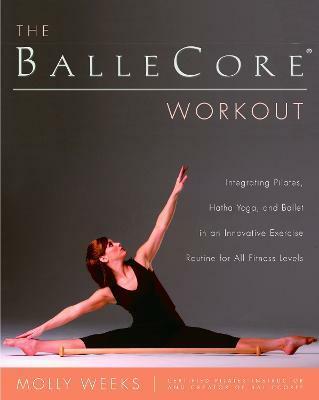 BalleCore is unique in that it combines three tried-and-true disciplines into one optimal workout. Pilates strengthens and stretches the major muscles, activates your core (the band of muscles below your chest), and energizes your body. Hatha yoga helps quiet the mind through breath, fortifies the nervous system, builds stamina, and produces mental equilibrium. Ballet increases blood flow, develops poise, promotes good posture, and improves balance. Fitness dynamo and faculty member of the Boston Ballet for the past seven years, Molly Weeks is the woman behind BalleCore. She has chosen an array of effective exercises from each of these three disciplines to create a fulfilling workout that can easily be done in your own home and in under an hour. The results? – Reduce backaches and stress – Develop stature, support the spine, and feel steady on your feet – Sculpt your arms, legs, hips, and core-and look trimmer than ever – Loosen those tight spots in the shoulders, neck, and joints – Gain an incredible sense of ease throughout your body – Experience inner calm, self-confidence, and renewed optimism With step-by-step instructions and profusely illustrated with helpful photographs, The BalleCore Workout(R) is the ultimate path to good health, longevity, and mind/body wellness. Remember: 50 minutes a day can change your life!